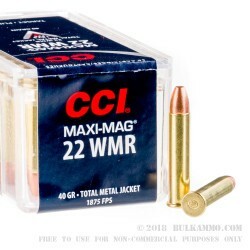 This Maxi Mag ammo from CCI is an excellent rimfire option for small game hunting and target practice. 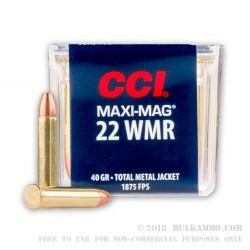 This 22 Win Mag cartridge is equipped with a 40 grain, full metal jacket bullet. 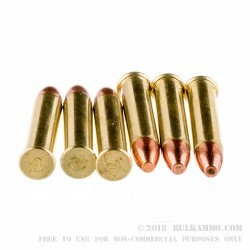 It is designed to reduce build-up in your rifle’s muzzle, making it an ideal round for weekend plinking. 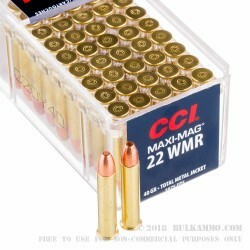 And with this 2,000 round case, you're sure to get a lot of value with this product. Headquartered in Lewiston, Idaho, CCI has been producing quality ammo and components since the mid-20th century. 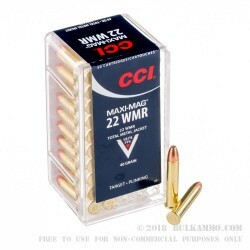 This 22 WMR round stands up to CCI’s longstanding reputation for making quality rimfire ammunition.